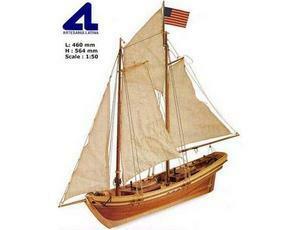 The Artesania Latina Swift Pilot Boat is a wooden ship model that recreates the real life ship with the finest detail. The Swift was a pilot boat at the beginning of the 19th century in Virginia, U.S.A. Their technical advantages led the US navy to enlarge the fleet to create the famous Baltimore Clipper class. The Artesania Latina Swift Pilot Boat wooden boat kit is of easy construction making this kit perfect for novice and advanced modellers alike.